Two fun and uniquely designed gym spaces- one that is 1,800 square feet and one that is 1,100 square feet. Both of our gyms consist of necessary equipment to aggressively address your child’s issues. 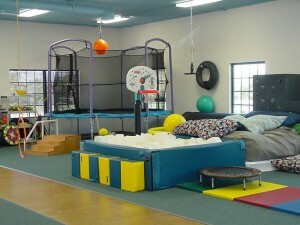 At our facility you will find a full size trampoline, foam pit, ball pool, suspended courses, scooter ramp, multiple swings and a fort which are all utilized in treatment sessions. Many pieces allow for optimal nervous system support while challenging physical abilities. An environment of challenge and novelty can evolve with your child’s abilities and promote the fastest progress. Testing room, speech and other offices comprise other sections of our 5,000 square foot facility. After receiving a thorough assessment, your child will experience one on one treatment in a structured, fun, and encouraging atmosphere. As they jump on the trampoline, play in the bean pool, or swing in the helicopter your child will be working to improve problems while having fun.